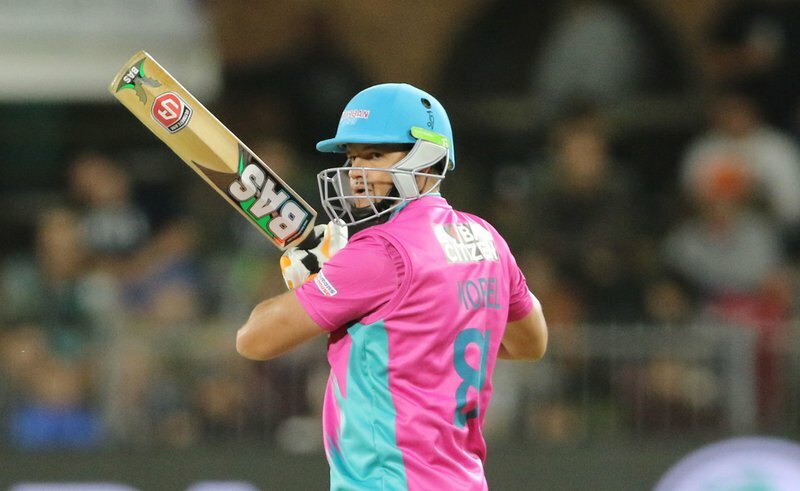 The Durban Heat needed maximum points from their Mzansi Super League clash with the Nelson Mandela Bay Giants in order to stand a chance of making the play-off, however rain had the final say at Kingsmead and the two teams had to take two points each. It was effectively the end of the play-off road for the Heat and they will have three matches left to put in three good performances. The Giants took first hit after winning the toss and they started positively with newcomer to the side Jason Roy dispatching his second ball for six after a close shout for LBW first ball off Keshav Maharaj. Roy and captain Jon-Jon Smuts put on 42 in just over five overs before seamer Marchant de Lange picked up the first wicket, trapping Roy in front for 26. Rudi Second joined his captain and the pair pressed the score to 64 in the eighth over before the rain forced the players from the field. When the players returned the match had been reduced to a 17 over-a-side match. When the players returned the danger man Smuts was dropped by SJ Erwee on 24 and the pair made the drop count. Smuts went to 50 off just 38 deliveries and the Giants went past 100 and the partnership over the 50 run mark. The Giants batsmen took the total to 113 before Second handed Rashid Khan his first Mzansi Super League wicket, caught in the deep by Erwee for 26 from 18 deliveries. Ben Duckett was the new man at the wicket and he, along with his captain, just added eight more runs to the total taking them to 121 for two when the rain blew in again in the 14th over. It was an unrelenting rain and at around 9:30pm the umpires called the game off and the two teams had to share the points. Debutant for the Heat and Afghanistan’s spin wizard Rashid Khan was the most economical bowler and he finished with one for 19 in three overs. The Heat now take on the Jozi Stars at Kingsmead on Friday at 14:00.